Carte De L'Egypte Ancienne et Moderne Dresse sur plusieurs Cartes Manus crites, assijeties aux observations Astronomique, Combinees avec les Itineraires Anciens et Modernes. A beautiful example of Rigobert Bonne's 1762 decorative map egypt. 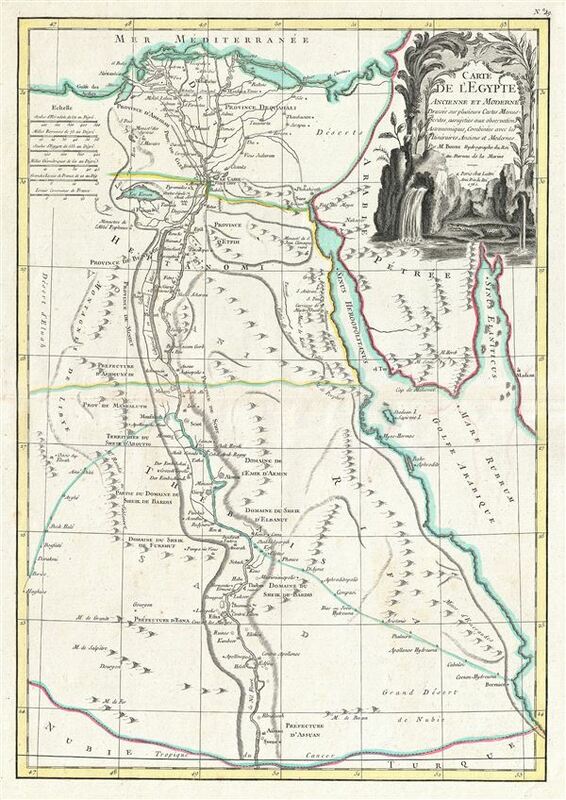 Bonne's map covers from the Nile Delta south as far as Aswan and the border with Nubia and includes the Sinai and parts of the Red Sea. The map identifies both ancient and modern (c. 1762) sites. Various Sheikdoms, Prefectures and Provinces are detailed throughout. An elaborate decorative title cartouche in the upper right quadrant features stylized date palms, the Nile Cataracts, and a typically monstrous Nile crocodile. egypt at this time was dominated by the waning Ottoman empire. Various internal disputes between Ottoman governors and local powers generally destabilized the region, leaving it open for Napoleon Bonaparte's 1798 invasion. Drawn by R. Bonne in 1762 for issue as plate no. 29 in Jean Lattre's 1783 final issue of the Atlas Moderne. Rumsey 2612.062. Phillips (Atlases) 664. National Maritime Museum, 215. British Libarary (World), col. 384-385 (1762-1785 eds. ).